TUMWATER, WA--(Marketwired - Sep 25, 2013) - Big Red "R" -- Rainier Beer Comes Back to Washington. The classic local icon, the original Rainer Beer logo with the BIG RED R, will be featured on O Bee Credit Union's newest debit card. 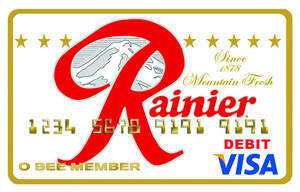 Now fans of this iconic logo can show their "Rainer Red" pride every time they take out their debit card. The Rainier debit card includes free checking, free mobile, free bill-pay, and free home banking as well as being one of the only debit cards offering reward points. The Big Red R was a familiar landmark along the I-5 corridor heading into Seattle for some 50 years. O Bee has negotiated licensing of the iconic brand with the current owners, Pabst. "Many people have fond memories of the Rainier Beer brand and especially the clever commercials during the 1960 and 70s. Rainier Brewery closed in 1999, and production was moved to the Olympia brewery for several years," said O Bee's Vice President of Marketing, Lee Wojnar. "Anyone living or working in Washington State can join O Bee and get our Rainier Debit card. We expect it will be very popular." For details, go to www.obee.com/heritage. Anyone interested in opening a free checking account at O Bee and receiving the new Rainier debit card can stop by any one of O Bee's five local branches or go online www.obee.com to sign up. O Bee Credit Union (The Olympia Brewing Co. Employees and Families Credit Union) was started February 15, 1955 by Ted McGill, who worked in the bottle house of the brewery. This full service not for profit credit union, owned by its members, has five branches located in Lacey, Tumwater, Tenino, Yelm (Opening in October 2013), and West Olympia. Membership is open to all Washington residents. Visit www.obee.com for more information about O Bee Credit Union. O Bee Credit Union's newest debit card features a classic local icon -- the original Rainier Beer logo with the BIG RED R.